“I was brought into this world to cause chaos and suffering,” the kid with the lanky black hair and tight jeans says, watching his friends goofing around in his suburban bedroom. He doesn’t look like much of a destroyer of kingdoms and universes, to be honest; just another Welcome Home young dude with bad skin and a very intense look in his eyes. But this Norwegian teen named Øystein Aarseth is about to help give birth to a subgenre of music that he hopes will be regarded as the sound of pure unadulterated evil – “True Black Metal,” he calls it. His band’s name is Mayhem. His stage name is Euronymous. “This will not end well,” he says in voiceover. He’s not lying. Based on Michael Moynihan and Didrik Søderlind’s book on the origins of a scene that would soon become notorious around the world, Lords of Chaos charts how that pimply kid and his pals put on some corpse-paint make-up, downtuned their guitars and crafted a doomy, shrieking, heavier-than-hell Mortal Engines noise that spread its seed far past Scandinavia. Yes, along the way some churches were burned, horrific murders committed and friendships ruined … but that’s the risk you take when you make influential art, right? If you’re like Euronymous (Rory Culkin), you pray – to Satan, or whomever your respective demon-deity is – that your music is heard and appreciated by the right metalheads. And if you’re like Kristian Vikernes (Emory Cohen), a.k.a. Varg, a.k.a. the Count, you take Aarseth’s “poseur” teasing and dismissive taunting of your Scorpions jacket patch as a challenge: So you think you’re evil? I’ll show you evil. 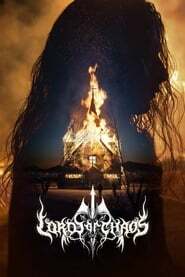 If you know what happens next, from Varg forming his own one-man black metal outfit Burzum to eventually stabbing Euronymous to death in 1993, then you just sit back and “enjoy” the ride that the movie’s in-house lord of chaos, Jonas Åkerlund, sets up. (Fun fact: The filmmaker was once in the seminal black-metal band Bathory. You’re welcome.) If you’re coming to this particular world as a curious bystander, you’ll be shocked by both the sheer nihilism on display and the contradictory silliness that the film emphasizes was an inherent part of this burgeoning subculture. Speaking in a flat Midwestern monotone – the movie jettisons any attempt to give the characters accents, thankfully avoiding a sort of Swedish-Chef–muppetathon – Culkin’s Dark Conjurer of Pain will loudly declare to his cohorts THAT THEY ARE MAKING THE TRUEST In Search of Greatness OF EVIL MUSIC AS THEY STAND IN THE BLACK CIRCLE! The director then cuts to a scene of Euronymous sitting in a drab record-store office or a brightly lit kebab shop, another moody teenager looking ridiculous and out of place. It’s rebellion as a come-as-your-favorite-Nordic-corpse costume party. They just happen to be dead serious about it.